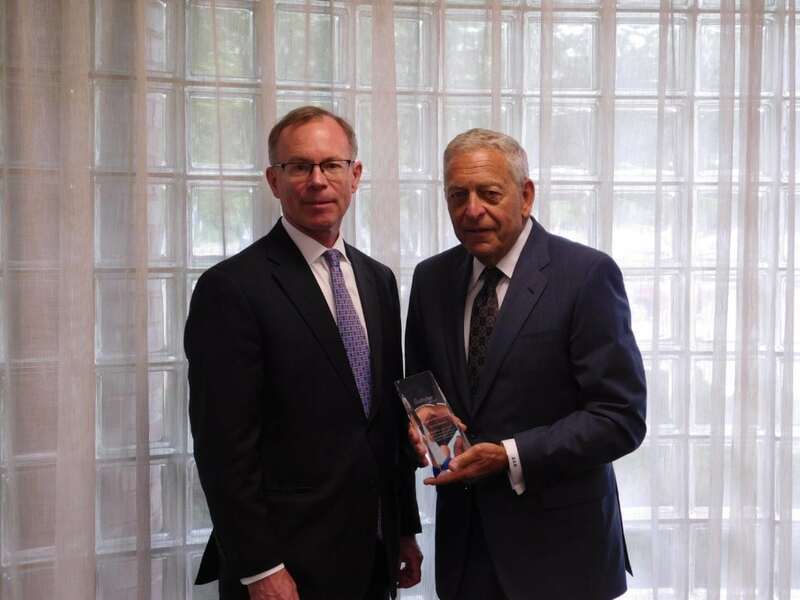 Bert E. Brodsky, a leading entrepreneur and long-time board member of a major non-profit senior healthcare complex on Long Island, was honored with the Trustee of the Year award from LeadingAge New York, the only statewide association representing the entire continuum of not-for-profit, mission driven, and public continuing care organizations. The award, given to those who have served unselfishly and with distinction on the board of trustees of a LeadingAge New York member organization, was presented on Wednesday, June 6 at 1:00 PM at the Gurwin Jewish Nursing & Rehabilitation Center in Commack, NY, where Mr. Brodsky has served as a trustee for the past 17 years. A serial entrepreneur, Mr. Brodsky has dedicated the last five decades to innovation in numerous industries, including healthcare, technology, real estate and hospitality. He was the Founder and Chairman of National Medical Health Card Systems Inc., and is currently active in many roles, including as founder and chairman of Medical Arts Office Services, Sandata Technologies, and Mobile Health Management Services, as well as Managing Partner of Didit.com. Outside these professional roles, Mr. Brodsky is an active philanthropist and community member, evidenced by his involvement in helping with the formation of a corporate parent for the Gurwin family of companies, and currently serves as the Chairman of the Gurwin Healthcare System. Mr. Brodsky joined the board of the 460-bed Gurwin Jewish Nursing & Rehabilitation Center in 2001, as well as the board of Gurwin’s 200-apartment assisted living community Gurwin Jewish – Fay J Lindner Residences, being elected to serve in a leadership capacity for both boards, and currently serves as chairman for both. He also serves as a board member for Gurwin’s proposed independent housing project – Fountaingate Gardens. In addition to his involvement with Gurwin, Mr. Brodsky is the founder and chairman of The Alzheimer’s Foundation of America, and has been honored for his achievements by his alma mater, City College of New York with an honorary degree Doctor of Humane Letters. He and his wife Muriel are committed to their children and grandchildren, passing on a commitment to caring for the community. Their son, Lee, follows in Bert’s footsteps at Gurwin, serving as Secretary of the Board of Gurwin’s Fountaingate Gardens, as well as on the boards of the ALS Association, Greater NY Chapter, and UJA Federation of NY, Emerging Leaders and Philanthropists, Executive Committee.